...catches the eye courtesy of transparent top and front sections and one of the best tempered glass side panels available at this price point. Cooler Master has expanded its range of MasterCase chassis by repurposing a similar underlying layout to fit various usage scenarios. 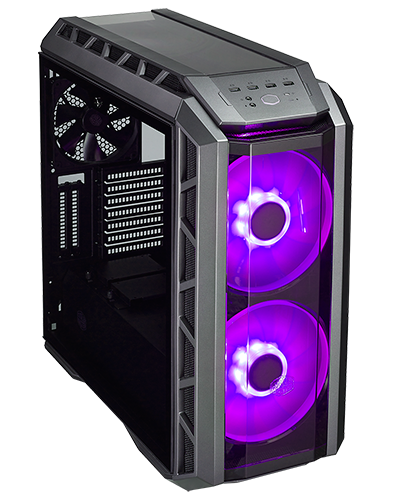 The latest edition, dubbed the MasterCase H500P, is a spiritual refresh of HAF (High AirFlow) and sets itself apart by incorporating dual 200mm RGB front intakes. Priced at £135 and dressed to appear both rugged and formidable, the chassis catches the eye courtesy of transparent top and front sections and one of the best tempered glass side panels available at this price point. The internal configuration should be familiar to anyone who has worked with a MasterCase enclosure, and compatibility with existing accessories is a plus point, but there are a few potential drawbacks to be aware of. The chassis' plastic accents feel noticeably flimsy, the omission of USB Type-C is disappointing, and though the option of vertical GPU orientation holds promise, it requires the purchase of optional extras. Bottom line: MasterCase H500P isn't perfect, but it's outfitted with two of the largest RGB fans we've seen, brimming with liquid-cooling potential and ripe for modding. The Cooler Master MasterCase H500P chassis is available to purchase from Scan Computers. Perhaps CoolerMaster should just do a version 4 of the CM690 which still seems one of their best value/quality cases. It may not be the best looking case around but it isn't the worst. what I do I like is how thoughtful they have been with making it very practical to work with (at least with air coolers and AIO's anyway), the ability to create a push/pull at the front for a radiator is very nice also, not sure I've seen that before in all honesty (well at least not designed for it from the outset anyway). it does have one of my favourite features - no hideous giant mesh top panel, I like this or the p7c1's approach. Shame that is is just so damn ugly.